So are you ready for some big projects to finally hit the blog? Yeah, me too. I’ve been a busy bee behind the scenes lately and I’m finally at a point where I can start sharing some of the progress! I honestly can’t believe it’s been over a year and a half since I revealed part of our Master Bedroom Makeover On A Budget. I only shared part of the room in the post with the intention of finishing the rest soon. Yes, did I mention that was October of 2012? Well, it finally came time to finish the space when I realized that it just wasn’t working for me. It’s not that I didn’t like it, it just wasn’t ME. There is a huge difference. I even mentioned in the post that it was a little more ‘glam’ than the rest of the house and I knew that I needed to make it a little more rustic and cozy to really feel like it went with the rest of our house. So fast forward to the last few weeks and I now have my Modern Farmhouse Bedroom! The biggest thing this room was missing was WOOD. I use wood in all of my projects and spaces and this room didn’t have any. So that was my first step. I added the DIY Barnwood Headboard and updated the nightstands. I didn’t want to do a complete overhaul, just tweak what I had already done. So I kept the stenciled walls and duvet cover and added new shams and pillows. It’s amazing what a few small changes can do. I know not everyone is not the white animal head trend, but I still love it! Anyone else still into it? For the pillows I picked up new pintuck euro shams from West Elm. I have been eying them forever and finally pulled the trigger! 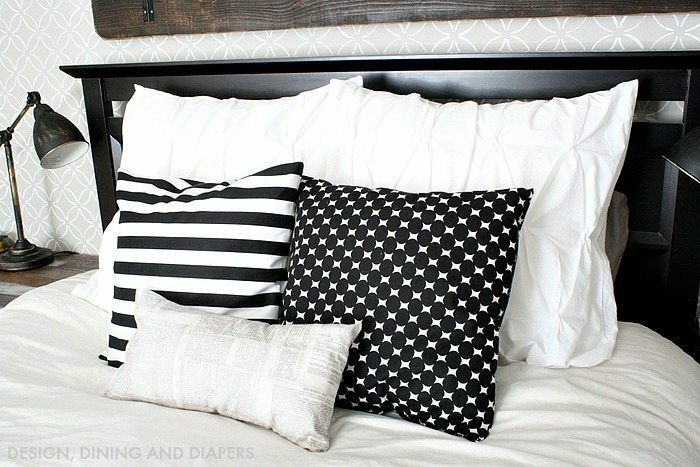 And then I whipped up the black and white throw pillows. I love the fun and bold statement that they make. And if you look closely, you can see that the long pillow is made with fabric that looks like book pages. I’d never seen anything like it before and when I spotted the fabric I knew I needed to make something with it! And I keep debating on whether or not I need something else on the walls above the nightstands. But then I keep thinking that with the stenciled walls and the massive barn door, I should just keep it simple and clean. Hmmm, the great decorating debate. Here is a glimpse at the different stages our bedroom has gone through over the past few years. The top was how I decorated the room right after we got married in 2008. Middle is the initial makeover I did back in 2012 and the bottom is today. I love seeing the progress! The new changes go so well with the Black and White Gallery Wall I added earlier in the year to our bedroom (that I still love). Now that this room is starting to feel a bit more like my style and the rest of our house I’m loving it and I can’t wait to finish it (really, I am going to do it this time!). – Anything else? Just ask! It looks amazing Taryn!! 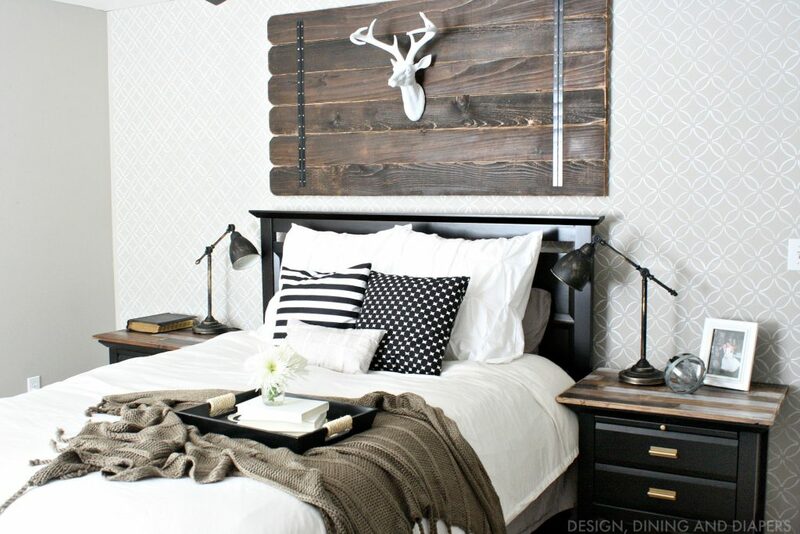 Love the barnwood headboard and, yes, this room looks so much more like you! Great job! ohhh Taryn! It’s gorgeous and you are right, this is much more YOU. I especially love the lamps – they look awesome and the wood on your nightstands looks great too – I can’t wait to see that tutorial! Beautiful job friend!! Girl I love it! This is definitely more you! I love your style, now come do my master bedroom! ????. I can’t wait to see more of your stuff! Absolutely beautiful Taryn!! I love all of the changes! Oh my goodness… stunning! Love your colour tones and reclaimed wood touches so much! I really really love this! I’m such a fan of black and white. (I’ve got my whole kitchen in black and white. I pinned you to my board and also to a couple of group boards. xo! This is beautiful. I love seeing the progression of the room. The small details are so great! Looking lovely, Taryn! It’s comforting for us newbies to know that a) it’s ok not to get everything done at once and b) it’s ok to change your mind. Just about suits me down to the ground! I’m curious… Did you re-spray your lamps black? What an amazing makeover!! 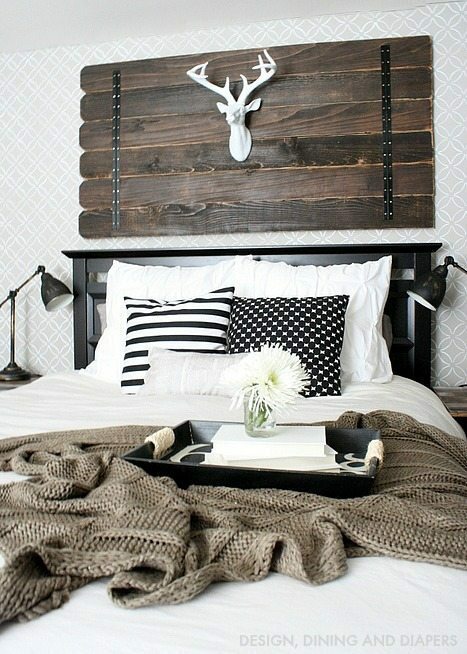 I love the barnwood accent above the bed! 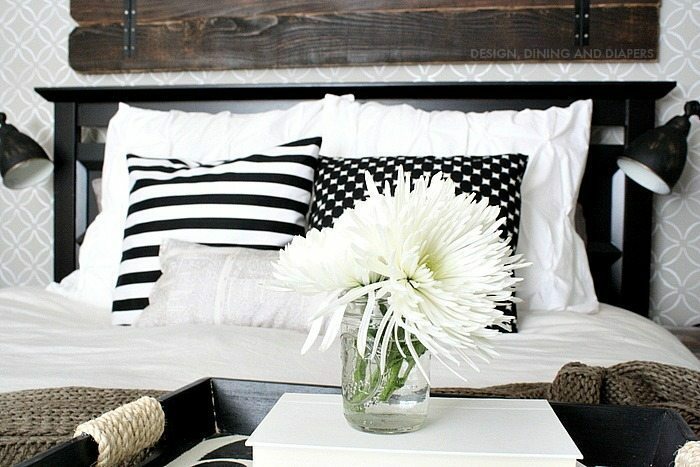 And the black/white pillows add just a great pop of drama! The lamps (I think you spray painted them??) are perfect now! Awesome!!!!! 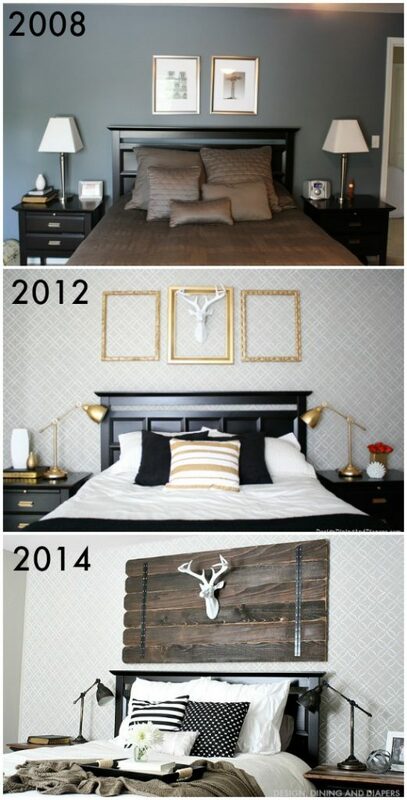 Love the room and transformation! Can you show a tutorial on how you finished the tops of the night tables using the black furniture? Thanks! I LOVE it! 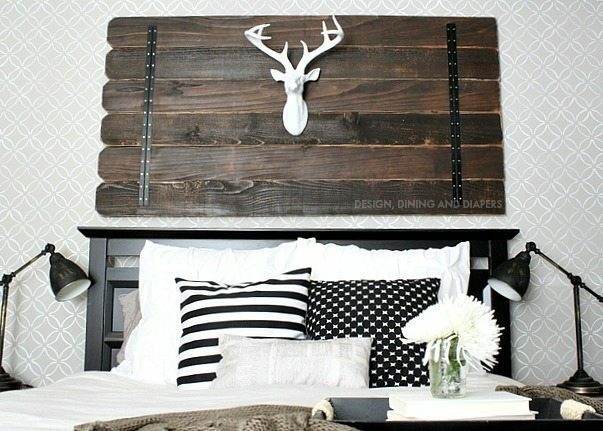 I am incorporating more rustic details into our home and really like the contrast. The barnwood is amazing! Love this reveal! I’m totally into the modern rustic look, such a cozy spin on the modern styles I love! 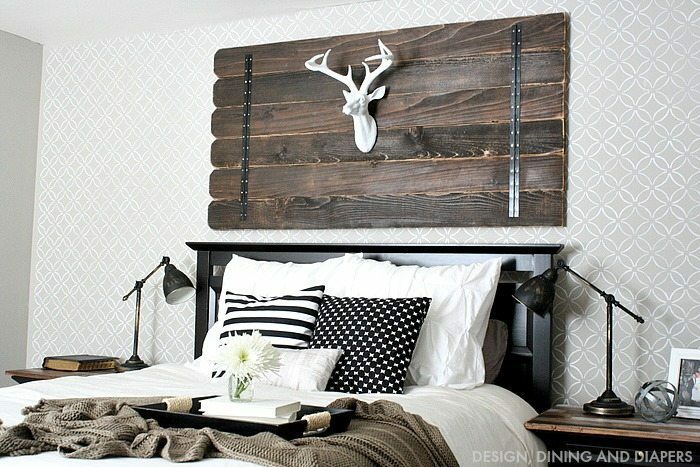 I love the headboard with the animal head…just perfect! Ooooooohhhhh…I love it! And thanks for sharing the progress over the years. We are in the midst of paying some more attention to our master bedroom and I am always looking for great, inexpensive ideas to make it look great. This makeover is unbelievable! I am in awe and in love with everything you have done. I especially love these lamps. This room is awesome! Love seeing how it has evolved over time. I love this so much! I am featuring you tomorrow… Thank you for linking up with The Party Bunch!!! 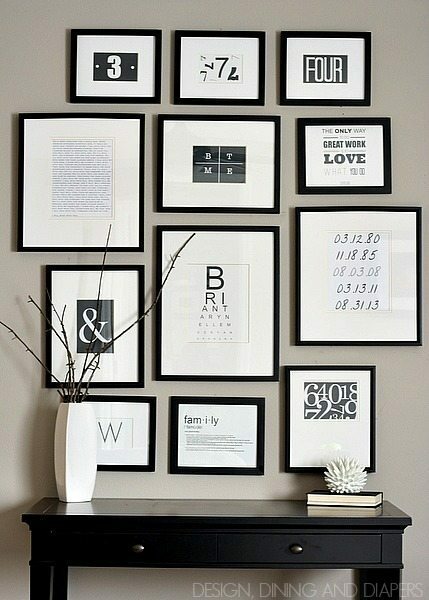 What did you use again to mount on it on the wall?